One of my favorite back-to-school traditions is going shopping for 'new' teacher clothes at all of my local Goodwill stores. I take a day and make the rounds to 5 or 6 of my area stores in search of great bargains on stylish & professional outfits! Upon looking through my closet recently, I noticed that at least 50% of my current wardrobe came from thrift stores. I often receive compliments on my outfits from my high school students as well as colleagues, which is proof that you can in fact be stylish and professional without spending a fortune! As a personal finance teacher, thrift shopping has also provided me with a way to demonstrate consumer saving skills to my students! Let's take a peak inside my closet as I offer some thrifty teacher outfit inspiration! The outfit shown above includes a thrifted eyelet sheath dress and a cardigan, both originally from Old Navy, and paired with a belt and sandals that I already had in my closet (not thrifted). I love to mix thrifted pieces with pieces I already own to create new looks. The sheath dress and the cardigan are both staple pieces that can easily be mixed and matched with other items. Below I've paired the same red sandals with some fun printed pants found at Goodwill! The outfit above, including the boots, was entirely thrifted at Goodwill! The green sweater from the first outfit was paired again with a cute printed dress and tights. Adding tights or leggings is a great way to transition pieces from warmer months to those dreaded colder winter months! Leggings/tights also help make items that may be on the shorter side a bit more appropriate for school. My first stop inside any thrift store is the dress section. You really get more 'bang for your buck' with dresses because they are basically an entire outfit in one piece and are often easier to make fit since pants can be a bit tougher to find the right length, size, shape. The polka dot dress above is from LOFT originally but thrifted for $6 and paired with other items already in my closet. The LOFT sweater dress above was found 'new with tags' at my local thrift store for $6!! Although the blazer wasn't thrifted, I've owned it for over 10 years and it's a great staple piece. I've seen lots of stylish blazers & jackets at Goodwill! Both striped dress above were Old Navy dresses that were purchased at thrift stores. They make awesome wardrobe staples because they are great transition pieces! Pair with boots on the fall/winter or sandals in the spring/summer! They also make getting dressed in the morning really easy and are school appropriate because they cover up everything without sacrificing style & comfort! Thrifted J. Crew wool skirt paired with items already in my closet! It also helps to have some basic sewing skills when thrifting because if you can shorten a hemline on a dress or skirt, you take home more great deals! I'm really short so sewing a straight line with my machine and a basic hem with a needle and thread were essential skills to learn early on. The dress below fit perfectly except in the length which was easily remedied with a hand stitched hem! I've even found some great evening/formal wear at Goodwill for great prices. The J. Crew silk taffeta dress above retails for over $200 new and I was able to purchase it for $10. The gold Banana Republic shoes were thrifted, too, and I wore this outfit to chaperone prom last year! The outfit above is more like 'teacher on summer vacation style' but obviously Goodwill has some great pieces for more casual looks, too. The dress makes a great beach cover up and the Cole Haan sandals are one of my all time favorite Goodwill purchases! When I'm hunting for thrifted clothes, or really any clothes at all, I also like to purchase items that can be worn both at school and in my 'real life'. All of the thrifted items above could be dressed up or down and even the strapless dress can be paired with a cardigan to make it school appropriate. Because I've found so many fantastic thrifted items, I find it difficult to go into other clothing stores to pay full retail price. Even the sales prices can't beat the prices I find at the thrift store! With a little bit of patience it is entirely possible to find great brand-name clothing and accessories at a budget-friendly price at the thrift store and you may just end up feeling pretty proud! 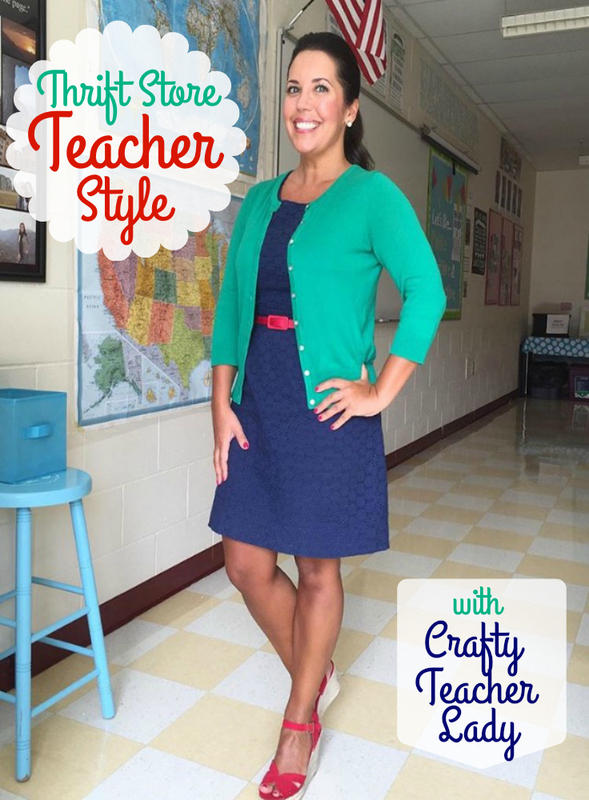 I post many of my 'teacher outfits of the day' over on Instagram! I hope to see you there!